Our tango community has lost one of its mothers. Margaret, and her husband Vance, were two of the first people I met in tango. Engaging and supportive - they both helped spread the 'gospel of tango' here in Austin and nearly everywhere they travelled. I had no idea at the time, almost a year and a half ago, how much they had done to support and expand this group. If you've ever traveled here for the Austin Spring Tango Festival, then you probably saw them - welcoming everyone, checking and double-checking details, and dancing when time permitted. Margaret was a graceful and very gentle soul. She had a gift for bringing people together. She had a soothing presence in stressful situations (an essential skill when organizing events like tango festivals). And now she's gone too soon. I thought I would have more time with her. That's only part of it, though. The rest of it is simply childish, selfish. I thought if I avoided thinking too much about the cancer claiming her health, that I wouldn't really lose her. Denial . . . I didn't get to say goodbye, or to say thank you. I wanted to say thank you for talking to me when I didn't know anyone at the milongas. And thank you for inviting me to participate in, and become part of, this wonderful community. When I read the news and told my husband, he asked if I was still going to the milonga that night. I think I just stared a moment. I had to go dancing - I don't know how else to cope with things like this anymore, but to dance. What did I do before tango? I don't want to remember. When things are good, I dance. And when things are too much to bear, I dance more. Margaret had a healing, reassuring way about her. This community shares her beautiful, welcoming spirit, and for that I am so grateful. 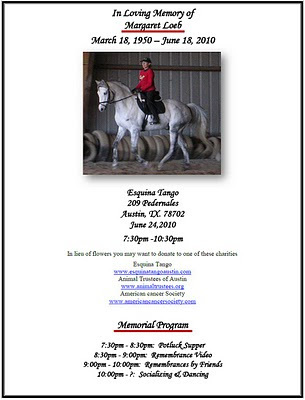 Information about her memorial at Esquina Tango June 24th, 2010 can be found here. I'm sorry to be writing so late--I hope it's all right. I just wanted to say I'm sorry for the loss of your friend. You've written her a very lovely tribute.